“I have always imagined that Paradise will be a kind of library,” said Jorge Luis Borges, Argentine author. I think so, too. A place filled with books from various authors containing different stories is indeed a bookworm’s paradise. However, that place exists only in my dreams. One day, I will have that place. But first I need books to inspire me and book sales to be able to buy them. I’m glad I waited long enough for these two warehouse sales in the Metro. Books that were once expensive can now be bought at a lower price. If you’re in or near the Pasig area, I’m pretty sure you’ll opt to visit the Books for Less’ month-long warehouse sale. The bookstore is known for its wide selection of new and cheap pre-owned books and magazines. 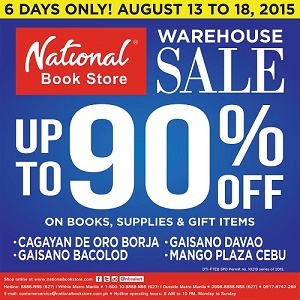 With their month-long warehouse sale, you’ll be surprised how many books you can buy with Php 100.00. Believe it or not, with this budget you can buy 5 books. Yes, a (any) book only costs P20.00. From August 1 to 31 except Mondays, you can choose from thousands of books at the Books for Less’ warehouse in #643 Mercedes Ave. Brgy. San Miguel Pasig in front of La Consolacion College. But if you’re not only buying books, visit National Book Store’s “The Great Warehouse Sale” happening at the 4th floor of Crossings Department Store and Supermarket in Quezon Avenue corner Scout Borromeo, Quezon City. Enjoy up to 90% OFF on books, supplies and gift items from August 13 to 18. Remember Christmas is coming. Buy yourself a book or two but don’t forget to buy for your family and friends. In addition, the bookstore is also having simultaneous warehouse sale events in different cities in the country. Visit their stores in Cagayan de Oro Borja, Gaisano Bacolod, Gaisano Davao, and Mango Plaza Cebu. Sounds like a lot of fun, doesn’t it? For book lovers, these warehouse sales are indeed fun. You get to see old and new books from authors you know and haven’t heard of. You get to buy the books you are interested in at a lower price like the ones I purchased at the “The Great Warehouse Sale”. 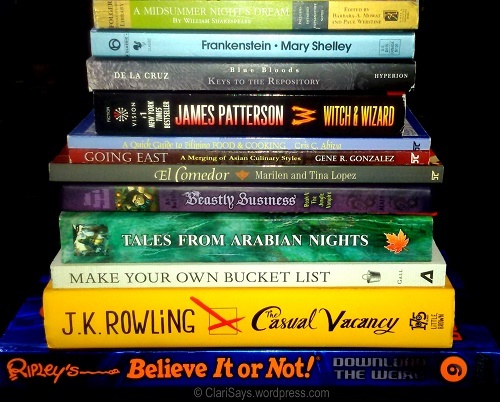 For only Php 925.00, I was able to buy 12 books. Great finds and great savings, indeed! But how far would you go for your love of books?